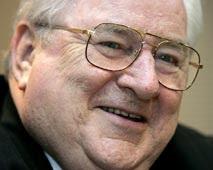 Like him or hate him Jerry Falwell was a tremendous leader who accomplished a lot in his 73 years. After passing up an opportunity to play pro baseball he went to Bible college and then committed his life to Christian ministry. He established Liberty University that now has around 10,000 full-time students and division I sports. He founded Thomas Road Baptist Church which has grown to several thousand. I actually interned in his youth department for a couple of semesters. He had founded numerous ministries like Television Gospel programs, unwed mothers homes, alcoholic recovery homes. He was a major influence in American politics in moral issues and was a frequent guest on talk shows. In spite of the views he is criticized for he thought highly of by many in the media for sticking to a simple message of the death burial and resurrection on most of his media appearances. He even helped shape my pastor and brother-in-law Matt Fry through Liberty University and time as the Thomas Road youth pastor. He even supported the planting of C3 Church, a ministry very different from his own. Whether you like all he accomplished or not you have to admit he was a man who led the way and stuck to his beliefs and accomplished much for the causes he believed in so strongly. Farewell to a great man.